All I can talk about this week is that I finished THE silk piece…hooray, hooray! and that I learned more about ”hard” pressing. I started this long project last (Bolivian) summer having brought back lots of lovely 60/2 silk from my trip away. I got home energized after having just filmed my Operating a Backstrap Loom dvd. I then filmed my Basic Warping for Backstrap Looms video in Bolivia, wove a wool band as a warm-up project (I had been away from any real weaving on my loom for about 2 months) and proceeded to launch myself into what I knew would be a long project both in terms of physical length and time. I knew that I wanted to do some three-color pebble weave with all three colors interacting on both faces of the cloth at the same time but I also knew that it would take far too long to finish if I used that kind of structure along the whole length of the piece. So, I limited this more complex structure to just the very start of the piece. Of course, I knew that I would need to repeat it at the very end…..but that was months away! After that initial band of three colors, I wove the rest using the same three-color pebble weave but with only two colors interacting on each face at any one time…gold and brown on one face and red and brown on the other. It is still quite time-consuming weaving this way but less so than having all three colors on both faces at the same time. The pattern theme for the piece is ”interlocking diamonds” and I enjoyed creating motifs in both pebble weave and supplementary-weft inlay to suit the theme. The main motif in the three-color section is charted in my second book….More Adventures with Warp-faced Pick-up Patterns. Some of the other motifs in two colors are also in that book while I invented others just for this piece. One of the best parts, as always, is feeling and seeing the transformation in the wet-finishing process. I have wet-finished a couple of 60/2 silk pieces before and was really excited to see how the silk cloth relaxed and shone as the iron lifted the moisture away. However, I was aware that the finished cloth wasn’t quite as stable as I had hoped it to be. So, I asked my online weaving contacts for suggestions and was lucky to get replies from those who have had a lot of experience working with silk and with wet-finishing in particular. Laura Fry has written a book called ”Magic in the Water” which is on the wet-finishing process and how it affects different structures and fiber. This piece finished up with beautiful sheen but not quite as stable as I had hoped. I learned that I should probably be a bit more vigorous in the washing part of the process…not the nervous, gentle hand-washing that I usually do. I used warm water this time instead of cool. But, one of the most important changes to be made was in the ”hard” press. I always iron on the floor as I don’t have a board….not that I do much ironing. It is mostly about my finished woven pieces rather than clothes. Now, this is a good thing when it comes to hard pressing as I recall having read stories of people having broken their ironing boards while trying to give their cloth a good hard press. Terry told us that the combination of heat, pressure and hard surface were ”perfect for imparting smoothness to a fibrous surface”. This, we were told, also applies to the paper-making process where it is called ”calendering”. Laura had said that compressing the threads is really important as a flatter surface reflects more light. Okay. So, how hard is ”hard”? Who knows… but when I am given instructions like this, I usually take them to extremes to the best of my physical ability. It reminds me of the time my weaving teacher in Peru told me to pull the weft really tight when weaving tubular bands. I sliced up my hand with the weft thread as I had it wrapped about my hand in order to pull it really hard. My bandaid-covered digits in the picture above show the result of having been told to grip the llama bone hard and beat firmly. With my teacher hovering and constantly reminding me to beat hard, I turned out cloth that was incredibly firm…a characteristic that is much admired by highland weavers. I was possibly gripping and beating too hard…hence the torn up hand…but I was pleased with the compliments I got from the weavers. As for the hard pressing, I placed a thin towel on my ceramic tile floor and put as much body weight as I could manage onto the iron. It was almost like doing push-ups with only my toes remaining in contact with the floor! Sara had reminded me that the cloth should still be damp when pressing or else wrinkles will be permanent. It was quite a work-out! Anyway, I got a nice shiny polished surface and I am happy with how the web has transformed into stable cloth. Now it surprises me to see how lifeless the piece looked while it was still on the loom. I’ll be pressing that teal bandanna again…hard… to see the difference that makes. …but with a different patterning structure and a different style of tubular band. And then, there’s jewelry…three-color pebble weave wrist cuffs and neck ribbons for various pendants I have been picking up along the way. There’s always something to keep me busy at the loom! To finish, let me show you an old photo I recently uncovered while tidying . This was taken back in 1996 before I came a backstrap weaver. It is possibly my first ever encounter with a backstrap weaver and this took place in the plaza of Cusco, Peru. I asked the weaver if she would weave for me and promised to buy the little loom I have in my hands if she would. She was more than happy to do so. 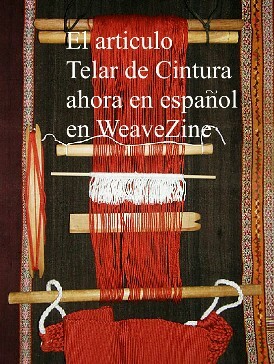 A few weeks later, I met a weaver from Ayacucho who was able to teach me. You are a fabulous weaver and teacher, but it’s your insatiable urge to learn more that is really remarkable. Always look forward to your posts! Thanks, Laverne for the inspiration! Thanks, Connie. It’s always nice to hear from you. Oh wow! The finished piece is incredibly gorgeous. Congratulations on finishing this exquisitely l o n g and delicate silk piece requiring such a deep well of patience and skill! I am so in awe of that multicolor pebble woven double weave and it’s hard earned glossy sheen. I love seeing your early photo of rapt attention at the feet of the weaver in the marketplace. It makes me yearn for all the “pre- blog” years we don’t have here that document your first efforts –how great it would be to read of your first dozen years of challenges and solutions! After this long endurance project anything you weave will be just some casual fun! You are right, Lausanne. i am having some casual fun now with some 10/2 cotton before launching another silk project. Thank you for your comments! Sending you hugs. You are doing lovely things with your tablets and seem to have a great study group going. This is the weaving equivalent of climbing Mount Everest! It is absolutely beautiful and I am not the least surprised that you finished it. Thanks so much, Barbara. Miss you guys. Exquisite in every way! And it really shines in that last photo. I do hope you will bring it to ANWG so that we can see it in person 😉 Thanks for the information on the ironing technique. I will definitely give it a try. It’s coming to ANWG Kristin. I hope it can be displayed in the exhibit to show off the shine. It can look quite flat in certain light. I am looking forward to meeting you and enjoying lots of backstrap loom talk. Twenty years later, you’re creating a MASTERPIECE. This is such an accomplishment – but like everyone else, I’m not at all surprised that you just sit down and did it. You’re constantly inspiring! I agree with Kristin: please find space in your luggage to bring this to ANWG!! Thanks, Tracy. Looking forward to seeing you, meeting Kristin and seeing Kristin’s amazing silk piece too. I want to hear about what you have been up to on your backstrap loom too. My silk wrap will be coming to ANWG. Yay!! Hoping for lunch or dinner together on Wed. or Thu. – it will be great to see you. Safe travels! Every comment is so true. The finished piece is amazing. I was in awe of your shawl. It was stunning.thanks for bringing it to ANWG. Thank you, Bobbie. I was happy to have the opportunity to show it at ANWG. It was a great conference, wasn’t it? !